Our first voyage since Bill retired from the US Coast Guard was a trip from Michigan to Oregon. Originally we were going to utilize as many military base famcamps, Walmart parking lots and truck-stops as we could. 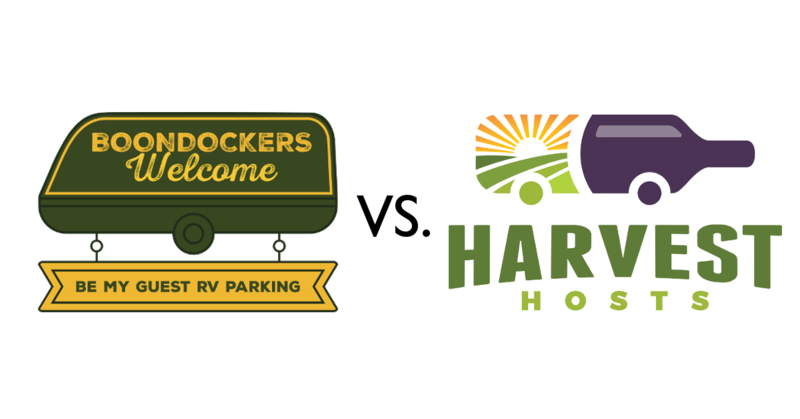 Knowing we had over 1000 miles to haul, we figured this would be the best way to eliminate overnight camp costs. However in order to save money in the long run, we would have sacrificed so much more. Thankfully a discovery while planning our routes saved us from looking at light poles and parking lots overnight. 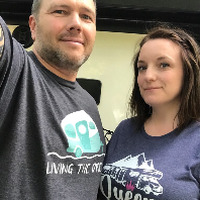 A few days before we were to take off, we discovered 2 subscription websites that offer RV’ers the opportunity to camp overnight for free. Boondockers Welcome and Harvest Hosts. These memberships are very similar yet so different, which is why we joined both immediately. During our cross country trip, we utilized both memberships and in this article we will compare both memberships and how they changed the way we save money during our travels. Pros and Cons on things about each subscription that you can find on their websites, as well as pros and cons on how we feel about both of them. We don’t want to sound repetitive to their website, but wanted to point them out again and how it helped or didn’t help us along our way. So here we go…..
We will start with Boondockers Welcome. With over 1400 locations throughout the US alone, this subscription gave us many options along our routes. The website platform is extremely easy to use on your laptop and smartphone. Searching the area is simple and the reservation system is quick. Having instant and constant communication with the hosts definitely makes everything flow smooth. This also helps when you may not have a strong cell signal to make an actual call, you can simply send an instant message through the website. We found this to be our case in many situations during our August trip. Some properties allow you to request stays weeks to a month in advance. Which we found helpful when we were planning a couple weeks ahead. A solid plan helps ease stress, at least we like to think so! Stays permitted can vary from 1 to 5 overnights. Which was also helpful when we wanted to explore the area more than a couple hours on our arrival day. Some properties offer water and electricity. Guests are required to offer to compensate hosts for their costs if they use hookups, but many end up refusing to accept cash. We show our gratitude by way of a small gift or handwritten card. Easy enough! This happened to us twice and it was a lifesaver. Each listing will have whats allowed and what’s not, during your stay. Generators, grilling, children, pets, etc. They will also have what size rig will fit on their property. This really helps you decide if this location is best, without having to ask a bunch of questions up front. There is a rating system in place for both the host and the guest. Some properties can be in their front yard which can be tight to maneuver and very un-level. Others can just be that, period, front yard or not. Some properties are located in a residential area, which can make maneuvering big rigs difficult at times. Over 600 wineries, breweries, farm and attractions throughout the US. Slimmer pickings towards the west but still many to choose from. All of which looked very interesting! We hope to hit up each one throughout our years traveling. Properties that are off the beaten path gives you the opportunity for peaceful nights, clear starry skies, and views to die for. Top that off with it being free and you are sitting pretty nice! The website platform is easy to use on the computer and although Harvest Hosts does have an app, we feel it’s a bit more difficult to navigate. Each listing will have what size rig will fit on their property and what amenities are available to you. Again this helps a lot when planning your stops without having to ask a bunch of questions before arriving. The opportunity to learn a trade like making wine, distilling alcohol, brewing beer. A chance to tend to farm animals or harvest a farm. Learn about history or simply help out around an attraction. Experience something new. Nights permitted to stay is just an overnight. Phone calls have to be made, if required for reservation (some say no call needed, just show up). There isn’t contact with the hosts via website or app. Requesting their cell contact during the phone call was the best way for us to have instant and constant communication via text messaging. Although it’s not technically “required” to purchase something from the businesses gift shop, it’s strong encouraged. Which in our case, cost just as much as a regular campsite at a park. No rating system in place, only a comments section on the hosts profile for a guest to leave remarks. Nothing in place for the guests. All in all, we really enjoy both memberships. Not only do we get to see and learn things we normally wouldn’t but we are making great friends along the way. I mean, sure, a Walmart parking lot or a truck-stop offers you a chance to hit up the grocery department but a lot of the locations we were guests at, had plentiful gardens that we handpicked our own vegetables at no cost. Win win.